July 3, 2017 – This week, our time machine enlists in the U.S. Navy with a trio of my fellow Garden State natives — brothers Bill, Benny and Barton — who serve in every corner of the World War Two fight in the Pacific. FDR taps Bill to run his first Map Room. Benny serves as the gunnery and anti-aircraft officer aboard the legendary USS Enterprise, which served in all but two Pacific engagements after Pearl Harbor. Barton, the youngest, ended up a prisoner of war under cruel, brutal conditions, after the Imperial Japanese overran his post in the Philippines, and the family never learned his true fate. 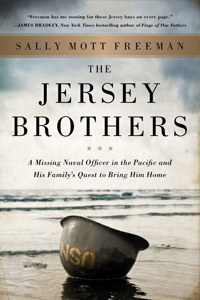 Our guest this week is Bill’s daughter, Sally Mott Freeman, who solves the mystery in her debut book, The Jersey Brothers: A Missing Naval Officer in the Pacific and His Family’s Quest to Bring Him Home . These three brothers are seemingly everywhere in the Pacific fight, from Pearl Harbor all the way through Bill briefing President Harry S. Truman on casualty projections for a U.S. invasion of Japan, solidifying the decision to drop the atomic bombs to bring a swift end to the conflict. Sally Mott Freeman is a former speech writer who’s currently Board Chair of The Writer’s Center. You can follow her @MottFreeman on Twitter or toss her a like at Facebook.com/MottFreeman. Watch our visit to the stern plate of the USS Enterprise, which is preserved next to the public library in River Vale, NJ.